The beginning of June is often thought of as the start of summer, but for many consumers it also marks the primetime of wedding season. While this may be exciting for couples who are looking forward to exchanging vows, all the festivities can get pretty expensive if you received a couple of save-the-dates. Between expenses for traveling, lodging, and suit and dress purchases, loved ones can often spend hundreds of dollars before the “I do’s” are even exchanged. This can create a lot of tension for guests who might also agonize over how much money to give or spend on a gift. 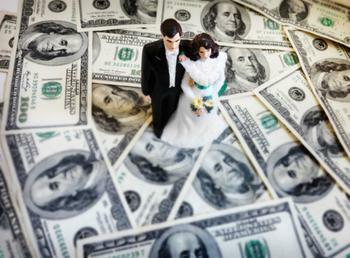 While it may not help your wallet in the long run, a CNBC report shows that the average cash gift for a bride and groom was $160, according to statistics collected by wedding-registry website Tendr. Wedding gift amounts tended to fluctuate a little more, but findings showed that they tended to spike during the prime summer wedding season. While the thought of spending hundreds on a gift may be shocking to some, a Bankrate.com study found that gift amounts tended to vary widely between different regions of the U.S. Researchers say that wedding guests in the Northeast gave the most, with 38% of respondents saying that the typical gift was at least $200. The study also found that 21% of wedding invitations were declined because respondents said that they felt they couldn’t afford to go. While it may be a shame to miss an event, Bankrate.com’s Cashlorette Sarah Berger says that consumers shouldn’t break the bank to go to a wedding they can’t afford. “Wedding traditions differ greatly from region to region, and so do gift-giving tendencies. Invitations usually go out months before the big day, so start budgeting early. However, if you simply can’t afford to go, be financially responsible and skip the event. No soiree is wroth sacrificing all of your savings,” she said. Berger says that another solution is giving a group gift or simply giving what you’re comfortable with. “In terms of how much you should give, whatever you think is appropriate and can realistically afford is what you should go for,” she said.